Be sure to read all the way to the bottom of this post! You can be a part of something big if you read on! Cara is hosting a new Friday linky while Kacey is taking a little Five for Friday vacation. I'm hoping this linky will get me back in action with the Pinterest game! Here are some of my favorite all around pins! Six Sisters' Stuff! If you haven't heard of them, where have you been? They have the most delicious and mouthwatering recipes I have ever seen! Their desserts are to die for! For those of you on a diet, I am just linking up a picture of the sisters themselves to save you from temptation. Go check out these ladies! You won't be sorry you did! This past year I rekindled my love affair with scarves. I found this fabulous website, Scarves Dot Net, that features 40 ways to tie your scarf. It's perfect to make sure that scarf never looks old! Be sure to pin this for the fall! Obviously you all know my obsession with nail polish, especially if you follow me on instagram. I am in love with this mani from Chalkboard Nails. It's got a bit of everything! She has such great inspiration for nail art! It's a go to in my book! Speaking of "chalkboard nails", how about these chalkboard nails! When it comes to teaching, I love to link my nail art manicures to the lesson/theme of the week. For back to school, I clearly think these nails are in order! What more can I say? 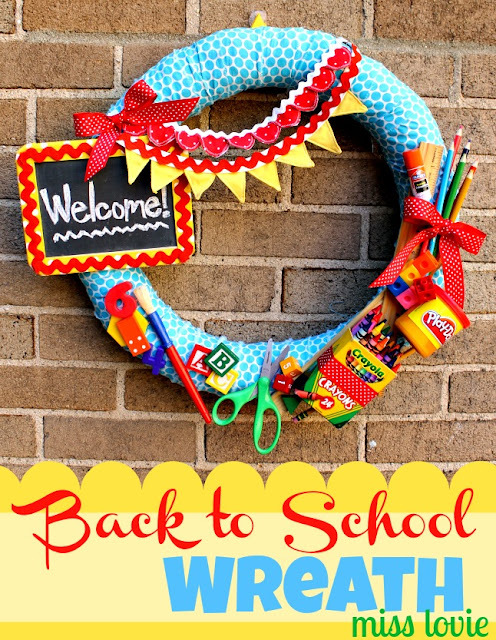 Sticking with the back to school theme, I want to make this adorable wreath! It's too cute and just screams learning fun! Miss Lovie has more detailed pictures on her blog. Be sure to check it out! 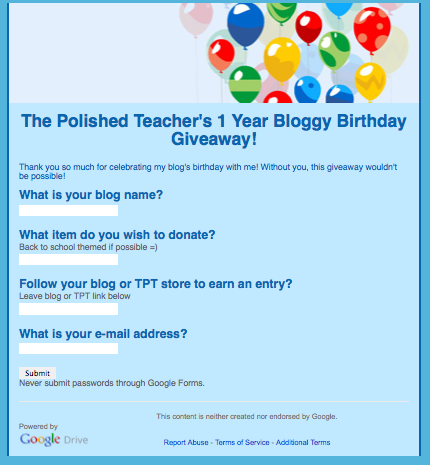 On a different note, next month my blog is turning one year old! Boy does the time just fly by! I posted a little giveaway poll on instagram and it was an overwhelming win for daily giveaways to celebrate. In order to make this grand giveaway happen like I envision, that's where you all come in! I had so many of my followers offer to donate a prize to help celebrate and I'm sure many more would like to help out as well. In order to keep things organized, I created a Google Form for you to fill out if you wish to donate a prize. Without you this giveaway wouldn't be possible! So thank you! The form is short and sweet. Feel free to e-mail me with any questions! LOVE the matte black mani! I don't know anyone who could do the designs though...might have to bug the artistic hubby for this one! Love your pins...those sisters recipes are eviiiiilllleeee! LOVE em! My waist doesn't though. Found your blog through the linky! Always great to find new friends! Thanks for sharing! I love the Six sisters Blog! (and yours!) Found you on the Favorite Pins linky! Too CUTE - thanks for the recipe tip! I am now your newest follower :) come stop by if you get a chance!